There are very few power tools that are handier to have around your house than a gas or electric pressure washer. There are just so many uses you have for them. That includes everything from washing your car to spraying off your sidewalks or decorative siding. You will be pulling out your pressure washer when the driveway needs cleaning or your lawn tractor had a rough day in the muddy yard. But how do you know a pressure washer is a good one? That is why we wrote this article. 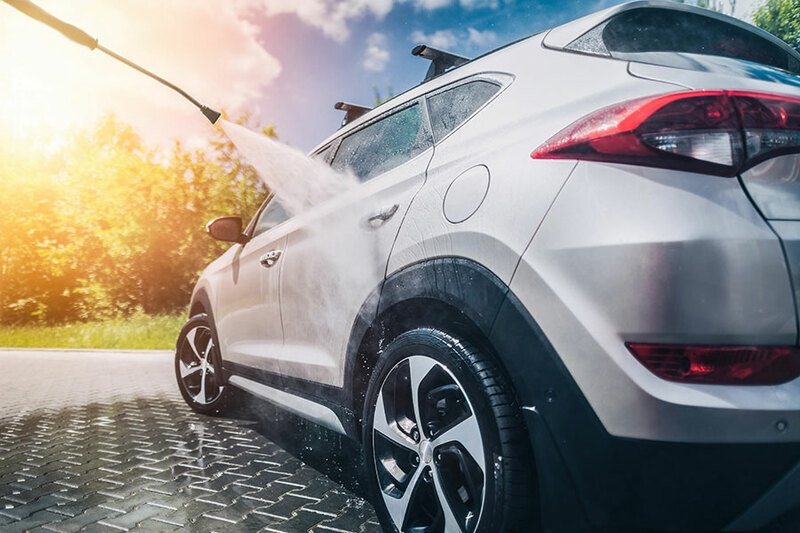 We will help you identify what the best pressure washer for cars is and for doing many other spray washing tasks around your home or place of business. This is the first electric powered pressure washer on our review list. What you sacrifice in power you make up for a lot with lower cost. Ford has made an exceptional low-end pressure washing product here. It can handle many pressure washing tasks around your home such as washing the car or spraying off your lawn mower after you use it. This model weighs a scant 25 pounds which makes it extremely portable for home use or for helping out your friends with their pressure washing needs. It also features a 35-foot electric cord with built-in GFI protection and a 4 selection spray nozzle. By far the best feature of this pressure washer is the price tag. It is by no means a pressure washer that will strip paint off your house but it will still do a number of cleaning jobs around your home well. Electric pressure washers are best kept away from commercial use due to many durability issues but they work fine around the house. The other thing that might turn some people off is there was some assembly required before you can use this model pressure washer. It certainly is hard to beat the Briggs & Stratton name when it comes to gas powered tools. They have come onboard here with a very good gas pressure washing model. It can easily clean your car, boat or anything else that needs to be washed thoroughly around your home. It has such great features as quick connect spray nozzles and never go flat tires. It can just rinse with a fine water spray or you can add detergent to the spray as you work. It even comes with a full 2-year limited warranty. The power this 420cc engine cranks out is absolutely incredible. It is powerful enough to do such tasks as stripping paint off of wood siding and getting tough stains and embedded dirt out of driveways and sidewalks. This is a great pressure washing product, to say the least, but it is also very pricey. You may be able to find a comparable model at a much cheaper price if you shop around and compare apples to apples. This product is another very good Briggs & Stratton powered pressure washer. There is no stronger name in small engines than Briggs & Stratton and this powerful pressure washer model proves it. It can handle big and small pressure washing tasks with no problems whatsoever. It has such fine features as a lengthy spray hose and easy to use spray handle. 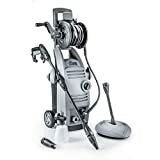 This model pressure washer also includes quick connecting spray nozzles and a detergent feeder that will add soap to the spray as you work. It also has a 2-year limited warranty. The best thing about this pressure washer is the tremendous 4,000 PSI it generates for cleaning power. The advanced triplex pump technology that it has makes this type of consistent pressure possible. This is one of the more expensive pressure washers on our list so it will not fit everyone’s budget. It is also a very heavy pressure washer so this is not the unit to buy if you need a very portable unit. This is a pretty powerful and a pretty affordable pressure washer for home use. Generac included many nice features in this bundled package. It has a reliable 196cc engine that will give you enough power to do such things as easily clean lawn furniture and patios. There is a wide variety of tools that come with it too including a special surface cleaning attachment. It also features a very long 25-foot long spray hose so you conveniently move only the hose when using it and don’t have to move the pressure washer itself so often. The price of this product is great for the amount of money you pay for it. You can do a lot of heavy-duty cleaning with 3100 PSI. The high-pressure surface cleaning accessory is also a very nice addition to this pressure washing package. There are some durability concerns with this machine. For one there seems to be a small issue with the pull cord assembly. Another mistake you don’t want to make is to buy this product if you need a pressure washer for heavy commercial use. 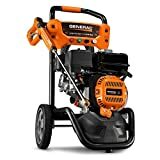 This is a really affordable gas pressure washer model that the Generac Company has designed here. It has the required amount of pressure to take on both residential and commercial type work. With its high flow rate of 2.8 gallons per minute, you can even do such things as strip loose paint off of wood with it. It comes with a generous 30-foot pressure hose, a comfort grip spray wand, and several interchangeable spray nozzles. The controls on this model pressure washer are designed really well. The best thing about them is that they are all located in the same area on the machine so you don’t have to go around looking for them. The controls even include a variable pressure knob to adjust the flow of the water stream that comes out of it. It is a little hard and time consuming to attach the pressure hose because it uses threaded connections instead of quick connectors like most pressure washers have. The folding handle design seemed to be a little bit flimsy to us for use on a heavy duty pressure washer. If you want a pressure washer with a strong engine at an affordable price, then you will definitely want to take a closer look at this Briggs & Stratton model. You get a lot of bang for the buck with this pressure washing machine. It has a generous 205cc engine displacement and it also is portable, 68 pounds when dry. That translates to a 2.4 gallon per minute flow rate. It also features a detergent injection system and comes with a 2-year limited warranty from the manufacturer. 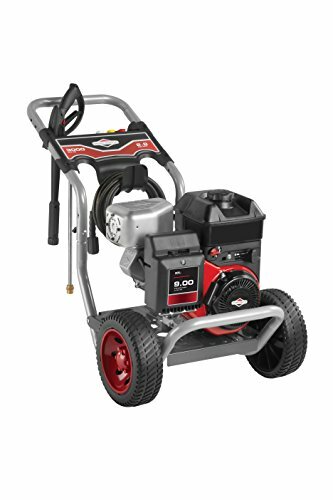 This is a lighter weight version Briggs & Stratton pressure washer but don’t let that fool you because it is still powerful enough to do most household pressure washing jobs. Best of all this is an incredibly priced product considering it uses famous Briggs & Stratton power. Although this product is well built you would not want to use it for anything more than light commercial applications. There also are no bells and whistles that come with this very vanilla pressure washer version. This is yet another very good quality electric pressure washer. 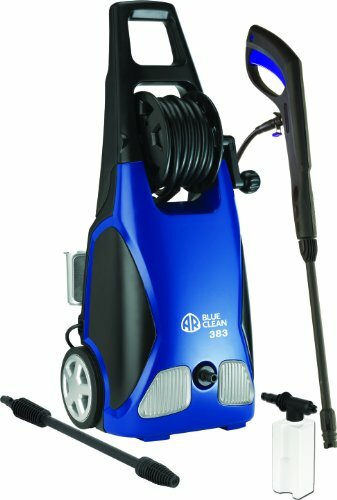 AR Blue Clean has a solid reputation as a company that only builds quality electric pressure washers. This nice 2000 PSI model really fits the mold there and will do a nice job for you on many household spray cleaning tasks. 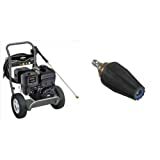 This model pressure washer is a very portable 42 pounds and comes with everything you need to start pressure washing just a few minutes after taking it out of the box. This sleek looking model is loaded with many handy pressure washing features. It all starts with its generous 30-foot high-pressure hose length and it also includes a detergent storage tank and 4 quick connect hose nozzles. It is also energy efficient and will cut down on water use by almost 80%. One thing we noticed that we did not like about this model pressure washer is that it seems to be a little top-heavy. Even a slight tug too much on the spray hose may cause it to tip and potentially fall. 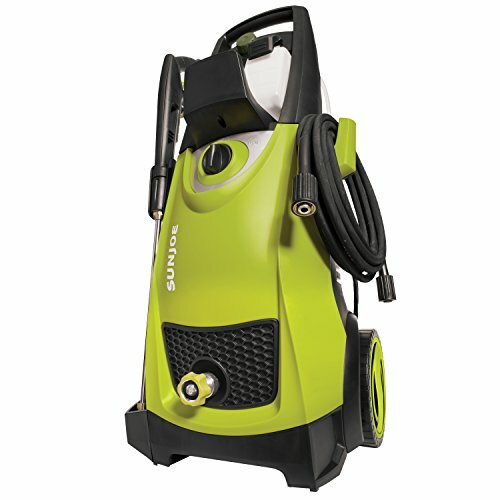 There is no better name when it comes to light duty electric pressure washers than Sun Joes. They build a quality pressure washing product and bring it to you at an affordable price. The pressure washing units they build are highly portable and are very powerful when compared to other electric power washers. This is a very lightweight unit that pumps out just under two gallons of water in a minute’s time. It features a 20-foot spray hose and a 35-foot power cord for easy portability. 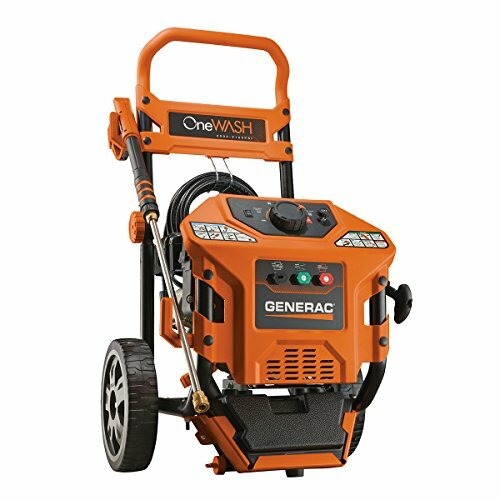 This pressure washer features a very powerful 14.5 AMP electric motor. What does that mean to you? That means it will put out a very generous 2000 PSI water flow. We were all very impressed by the amount of flow that this electric pressure washing product has. There were a few concerns we had with this product. For starters, we thought the hose reel was positioned badly and that it was also not built very sturdy. We also did not like the way the incoming water hose attaches directly to the hose reel system instead of connecting it in a more convenient spot to get to. This is a pretty unique design from Powerhouse International that has quite a few innovative features on it. With a generous 1.6 gallon per minute flow, it makes a great pressure washer for household use. 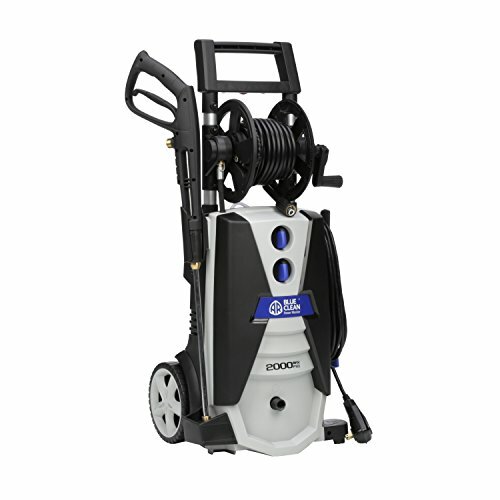 This pressure washing unit is very lightweight which makes it extremely portable. It also comes with a spinning patio cleaning attachment. All of the accessories conveniently store right on the unit itself too. The best thing about this pressure water has to be what powerhouse international refers to as their ‘total stop system’. This means when the handle on this machine is released the motor itself stops running not just the stream of water. It should really make this pump motor last a lot longer than normal and it saves on water too. This model pressure washer works well enough but the hose reel is located very high up in the handle. That makes it a little hard to move and a little tip prone because it’s so top-heavy. This is also one of the loudest machines that we tested which will be a problem for some. Here is yet another innovative pressure washer design from Powerhouse International. This one focuses a lot of its design on making this a highly mobile pull behind pressure washing unit. That makes it extremely convenient for doing such things as washing the family car or spraying down your patio furniture. It is also a very affordable pressure washer for one that has over 1800 PSI of washing pressure. This unit weighs only 17 pounds in total and all of its accessories will store right on the unit itself. By far the best thing about this pressure washer is how portable it is. It moves around with you more like a canister vacuum than it does a cumbersome top-heavy pressure washer. On surfaces like cut grass and concrete, it is really simple to move around. This unit is lightweight and portable but we wonder if the durability of the unit was sacrificed to make it that way. It is also important to note that this unit is definitely not made to go over rough or uneven ground. Sun Joe’s has done it again by making yet another simple but effective and affordable electric pressure washer. This is a great design on their part. It will easily take care of the majority of pressure washing jobs around your home or office. It comes complete with a 20-foot pressure hose, a 35-foot electrical cord with GFI built in and a 34-inch spray handle wand. 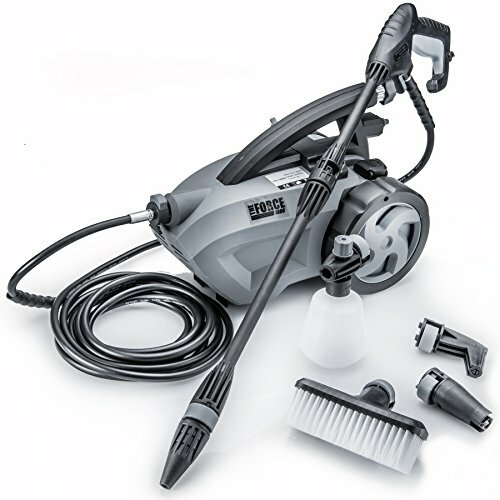 It will also deliver over 2000 PSI of cleaning pressure with its powerful 14 ½ amp motor. There is a long list of great features that are included with this pressure washer. It comes with 5 interchangeable nozzles, dual detergent tanks, and a total stop pumping system. Let’s not forget about the generous 2-year warranty on it either. This pressure washer can only use special soap because the soapy water runs through the motor and we thought that was a big inconvenience. For heavy duty jobs, you need to put the nozzle very close to the surface too and this will strain your back a little. The reputable AR Blue Clean company has added yet another pressure washer model to our list of great pressure washer buys. There are simply so many cleaning tasks you can do with this model and 1900 pounds of pressure per square inch that it delivers. It is a small but mighty pressure washing product. 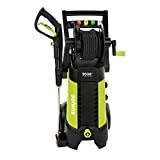 It is a pressure washer that comes complete with 20 feet of high-pressure hose, 35 feet of electrical cord with built-in GFI and several different spray nozzle attachments for doing different types of cleaning jobs. This unit is definitely for those of you who are into environmentally friendly products. This is a water saving model pressure washer will save you over 80% more water during its use than more conventional pressure washers’ use. It also is a quiet running model so it does not add to noise pollution as some pressure washers do. We did have a few concerns with this pressure washer. For one, the high-pressure hose is very stiff and easily becomes tangled up and hard to separate as you use this machine. Some of the hose connections leaked a little bit more than we would like to see also. Buying a pressure washer does not have to be difficult and stressful. You just need to focus on a few key characteristics that most pressure washers normally have. This will help you quickly narrow down your choices so you can hone in on the right pressure washer that will best fit your needs. You may also like Safely Buff & Polish Your Car to Perfection! Price is not always indicative of the quality of a product but in the case of pressure washers, it often is. More expensive pressure washers tend to hold up better and have more power for doing tough jobs. Gas pressure washers tend to be the most expensive and electric pressure washers are much more reasonably priced. 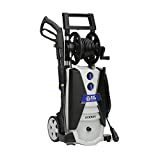 Be aware though that you can find some excellent deals on pressure washers in the marketplace too and save a lot of money for a model that will work well for you. 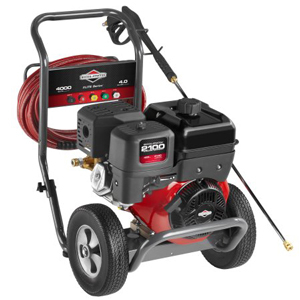 We just mentioned that gas-powered pressure washers are more expensive than electric powered pressure washers. These are the two main types of pressure washers. Here are the benefits and drawbacks of each pressure washer power source. These types of pressure washers are made for mainly light duty pressure washing tasks. They are great for cleaning cars, boats, driveways, and walkways. One should use extreme caution when purchasing them for commercial use because they are not nearly as durable as gas pressure washers. They are great for home use because they are very portable and can easily handle most small to medium pressure washing tasks. They are also relatively inexpensive compared to their gas consuming cousins. These are the workhorse model of pressure washers. They are the ones that can take on heavy-duty tasks such as stripping paint and etching concrete surfaces. They generally will have 2x or more pressure than most electric models. They also tend to have big tires to help them easily move around because they are so heavy. Gas powered pressure washers are by far the most preferred pressure washer by those that will use them commercially. When you are looking at purchasing a pressure washer you have to be aware of the predominant tasks you will use it for. Whichever pressure washer you buy will have to have enough PSI (pounds per square inch) of water pressure to do the job. Cleaning the siding of your house or your car only takes about 1500 PSI to get done. Bigger jobs such as stripping paint off of siding and cleaning barnacles off your boat will require upward of 2500 PSI to get the job done right. So it’s important to know the PSI required for the tasks you want to do with your pressure washer before you make your purchase. A pressure washer is a piece of equipment that takes a lot of wear and tear. Anytime you have a situation where you have hot parts potentially coming into contact with cold water it is a recipe for disaster. That is why you definitely want to get as long and comprehensive a warranty as possible on any pressure washer model that you buy. It will give you a lot of peace of mind that the money you spent on your pressure washer was a safe investment. Warranties are also a good way to tell the type of confidence a manufacturer has in their pressure washing product. The longer the warranty, usually indicates the more confidence a manufacturer has in how well their product is built. Cleaning your vehicle with a pressure washer is a bit of art actually. You can’t just turn your pressure washer on and blast away. You might actually hurt your car’s delicate finish if you do that. Here is how it is best done. Start by selecting a nozzle tip that has a gentler fan type spray. A fine spray tip can take the finish right off your vehicle when the PSI is high enough. Most pressure washers have adjustable PSI settings so err on the side of caution and start with a lower setting such as “1200 PSI”. Adjust the pressure upwards in small increments of 100 PSI until you find a safe setting that works well. Also, never place the tip of your nozzle closer than 2 feet away from your vehicle. The next step is doing an overall rinse on your vehicle. This will get any loose dirt and debris off of your car. Soak it really well during this phase. 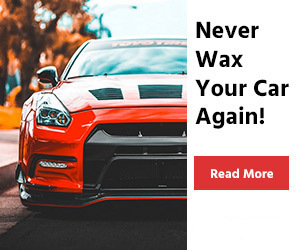 Don’t be afraid to spray the undercarriage of your car here either; just don’t get an excessive amount of spray on the inside of your tires near your brakes. If you have a detergent reservoir on your pressure washer then go ahead and fill it with auto washing soap that is approved for use in your model pressure washer. With the reservoir open go over your entire vehicle again with the water/soap mixture and once again soak it well. At this time you may also want to use some tire cleaner and a Teflon pan cleaning pad on your tires to shine them up. No car will look clean if the tires on it are not clean and shiny too. Work fast here because you don’t want the soap to dry on your vehicle while you are cleaning the tires. Now it’s time to give your car a good rinsing. Make sure you get all of the soap off of your entire vehicle because soap will tend to make your car look dull in the areas that it is allowed to dry. Spray the cleaner off the tires good when doing this too. Your car should now be shining brightly. The best way to finish the job is by vacuuming and detailing your interior and you will also want to give your vehicle a nice coat of wax every so often too. You can even try using a wax that can be directly applied with your pressure washer. You save time while doing a job that is not hard at all. As we all know a pressure washer is a wonderful invention that is extremely easy to use. It has so many advantages and here is actually one of the biggest ones. Imagine if you had to clean your car with only one bucket and one hose, it would take you forever to get the job done. But with this you are able to clean your vehicle’s exterior perfectly, getting rid of all the dirt and nastiness and so on in under 15 minutes. You can use a pressure washer for several activities. It is not said that you should only use the pressure washer to clean your car. There are so many other things that you could make shine. For example, you could clean your driveway or the outside of your entire house. The high pressure makes everything so easy. It doesn’t matter if you are having troubles with oil stains, grease, bird poop or even smudges. If you have a pressure washer and know how to properly use it you can get rid of everything. Twigs, mud, and leaves that are probably stuck between the cracks of the car’s parts are now not a problem at all. When using a bucket this task would be so much harder. And the coolest thing for the squeamish folks is the fact that you don’t have to touch anything – the high water pressure will do the job for you. Pressure washers are friends of the environment. If you compare the amount of water that a simple garden hose and a pressure washer use, you will see that the pressure washer could even save you money from your water bill. Some studies say that as much as 75 percent of water can be saved if you simply use this instead of a garden hose for a pressure washer expels water 50 times faster than a garden hose. Doing the same amount of work as a garden hose but a lot faster and easier, this gadget is a must-have in your garage. However, this is not the only benefit when we speak about the environment. You should know that there are pressure washers that use hot water and some that use cold water. Now if you use a cold water pressure washer, you have to add some chemicals to the mix if you want to clean your car. But if your pressure washer uses hot water you don’t need to use any dangerous chemicals and that is good not only for you but also for nature. The problem area is affected by the heat and the dirt particles that we want to get rid of are being heated up and removed. For it is not a big machine, a pressure washer will occupy very little space in your garage or storeroom. The components of the pressure washer can easily be removed and that way you could make it even more compact. The weight of the item is not worrying at all and you can easily drag your pressure washer to the place you want thanks to the wheels that almost every machine has. Now let’s talk some serious business. Pressure washers, when not used properly, can actually be dangerous. That is why it is of great importance to know how to use this machine. 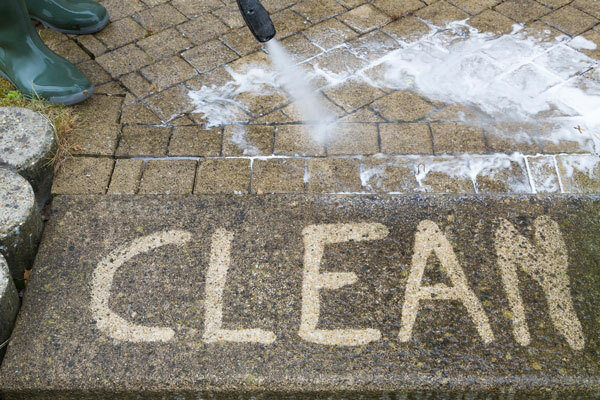 Our team has created a short list of tips that you could use when it comes to cleaning with a pressure washer. Wear proper equipment! – Shoes, clothes, gloves, goggles, everything that you can think of! Your eyes should always be protected for there could be flying debris. It’s not going to be really nice if it gets stuck in your eye. Always read the user’s manual! – Everything that you need to know should be written there, Follow the recommendations thoroughly and everything should be okay. Always keep the user’s manual after you have read it! – There is always a chance that you may need it again because you have forgotten something. That is why you must not throw it away. Don’t even think about using a gas pressure washer in an enclosed space! – Carbon Monoxide is a poisonous gas that is exhausted from combustion engines. If you are in an enclosed space you will most surely breathe it in and that is not something you want to do, trust us on that! Dizziness and headache are just one of the things that you could feel. Choose carefully where you are using the pressure washer! – Your surrounding is incredibly important. If there are kids that are playing around you or even vehicles that move you could get in a situation that could be dangerous. Do not underestimate how you are feeling today! – If you are not in the mood then just don’t do it. Something like a pressure washer could be really dangerous and you have to be one hundred percent focused when you are cleaning with it. Think about the details! – Is the weather suitable for pressure washing? Is there something electrical around me? Have I closed the windows of my car? Those are all questions that you should not neglect. First, start with the lower spray nozzle and then continue on to the next! Don’t even look at the red tip nozzle let alone think about using it! It is used… let’s see – almost never and the same thing goes for the yellow tip. The tip that people mostly use is the green one and that is what you need to do your job quickly and efficiently. Ladders and heights are the things you should avoid at all costs. – The name “pressure washer” is not just a name. It shows you that we are talking about power here. And there is nothing more stupid than working at a height when using such a machine. It’s not worth the risk. Even a fall from a height such as 3-feet could be quite dangerous, for example, you hit your head. Keep your both feet on the ground and buy an extension wand if you need to. 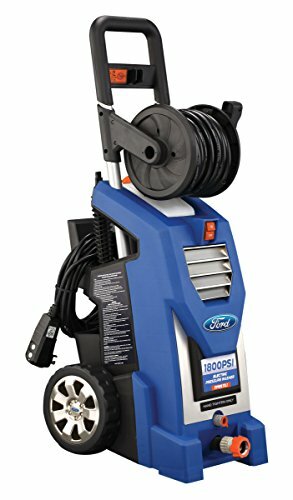 Can I use my pressure washer for other purposes than cleaning my car? – Yes, there are so many different things that you could do. You could clean your house on the outside or even your driveway. Are pressure washers expensive? – You could say so but for the amount of work they do and the benefits they have, they are an investment that is a must-do. And think about this: by having one of these machines you not only save time and efforts but you also save money because these items are eco-friendly and they use less water than normal garden hoses. Can I easily transfer a pressure washer? – Yes, you could even put it in the trunk of your car and drive to your best friend’s to help them clean their own car. They are light, easy to store and simple to move. Is it really necessary to wear equipment? – It is crucial that you are dressed properly. The injuries that you could sustain could be huge. So put on some protective shoes and some proper clothes and then start doing what you were going to. Which nozzle should I use? – Most people use the green one. It’s safer and will do the job perfectly. It is important to remember that you have to stay away from the red one. Is there a difference between pressure washers that use cold water and such that use hot water? – Yes, there is actually a big difference. 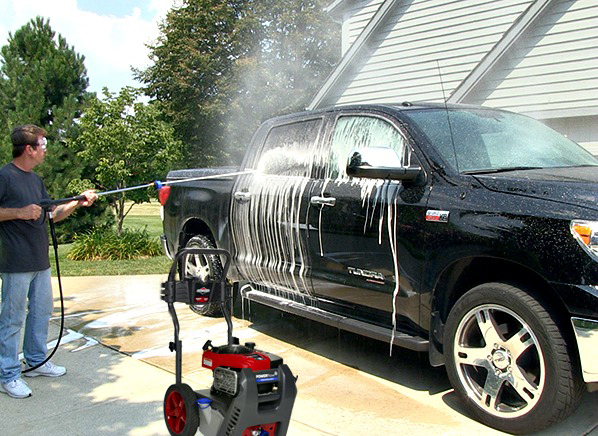 Hot-water pressure washers are used if you want to clean your vehicle, house, etc. because of their three key elements – agitation, heat, and soap. Cold-water pressure washers are used when you want to strip the paint of the car, or just blast away sand and mud. 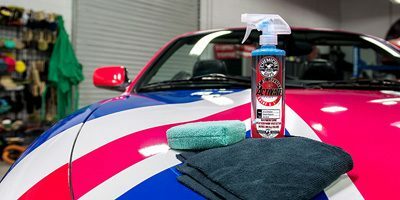 You may also like: The Benefits Of Using Good Car Air Freshener, tips for protecting your car with paint sealants, What is the best cleaner for car upholstery? $ 28.5 x 12.25 x 11.25 inches 27 pounds 1900 1.5 Turbo and variable nozzles. There simply is no arguing the point that a pressure washer has so many uses for around your home or as you go about doing your business. You just have to make sure you select the right model pressure washer to meet your needs. If you follow the advice given here you should have no problems finding the best pressure washer for cars or one that will meet any of your other pressure washing needs. When in doubt which one will work best for you, remember that all the products in the pressure washer reviews are extremely good models.